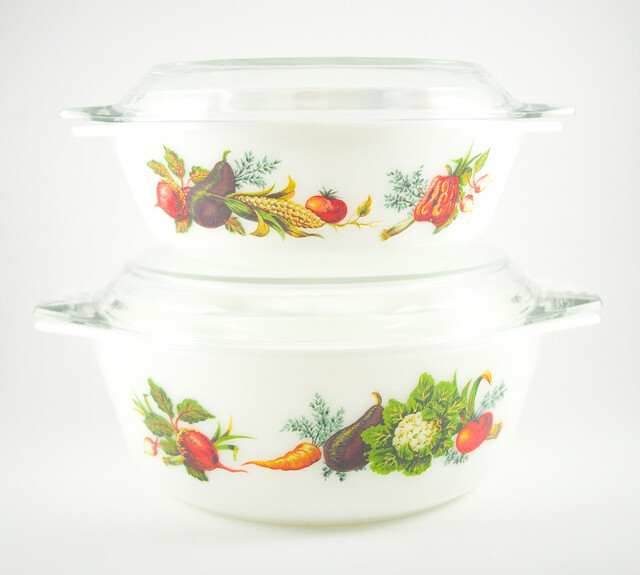 I’m super excited about the Easter edition of 613flea coming up this Saturday because I’ve managed to source some absolutely fabulous “new” vintage Pyrex! It’s all beautiful, and some of it has become quite rare. 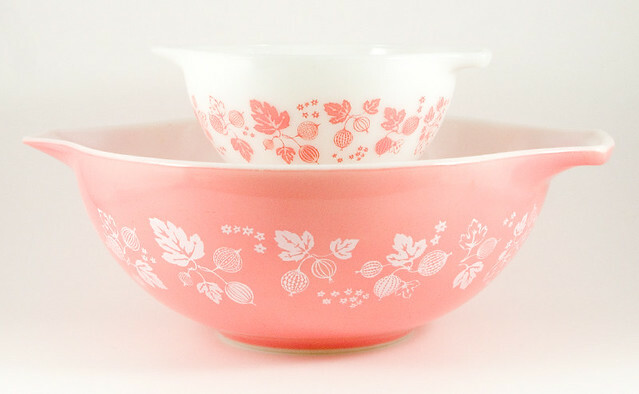 Pink Pyrex is highly prized because there weren’t all that many patterns released in this popular colour. 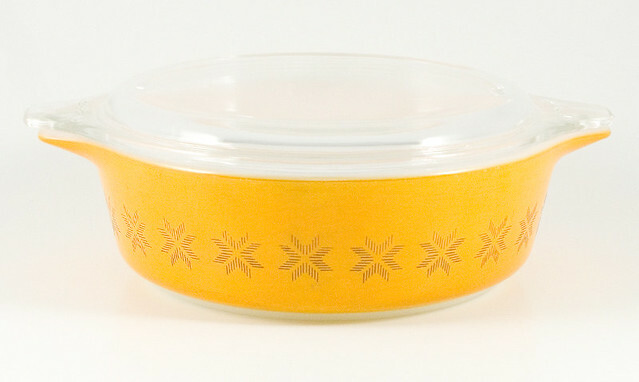 Butterprint is an extremely popular design, so much so that when Pyrex released their modern “Vintage Charm” line, one of the most common is quite obviously an updated version of this pattern. The Balloons pattern is extremely rare; it was only released for the one year, so there weren’t many of them made. This has made it a highly sought-after collector’s item. 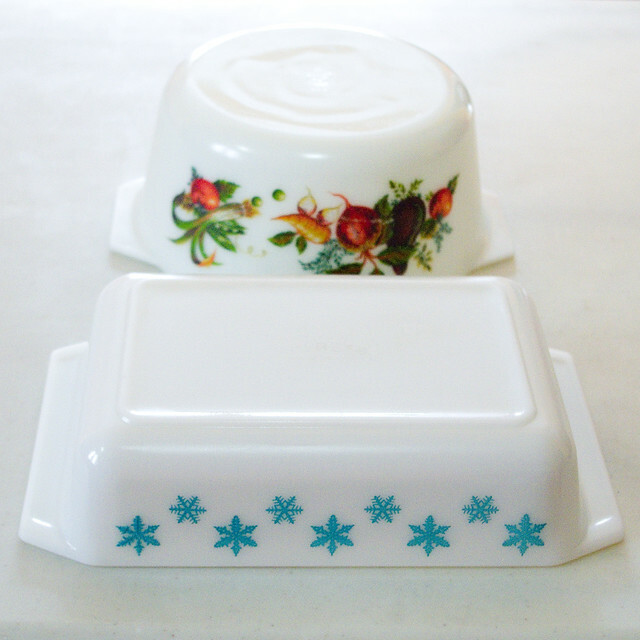 The Town and Country kitchenware was available as a large mix-and-match series, which is why so many of them survive to this day. They’re not as rare as some of their older counterparts, but they remain colourful and versatile. With Butterfly Gold we start getting into colours and patterns that I remember from my childhood; many people who had children around my age would have received kitchenware in this pattern as a wedding gift. The Woodland pattern is less common than the Butterfly Gold, although they’re from the same era. As an aside, this was a battle I was constantly fighting while trying to get these photos: my cat really likes my light box. I’m not sure why I was surprised, as it was both warm from the lights and, well, it’s a box. 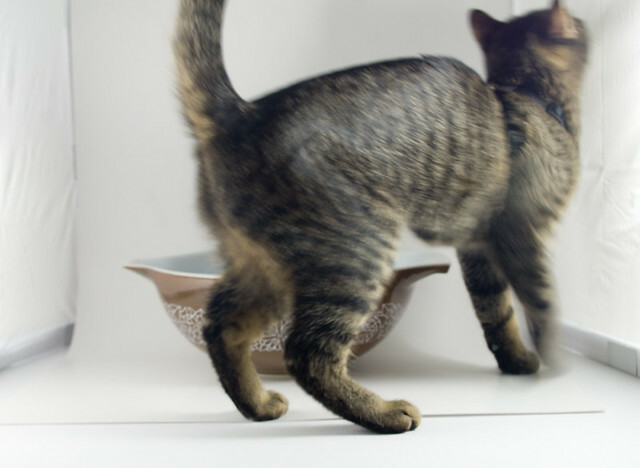 I use a long exposure because the lights aren’t all that powerful, which is usually fine since the dishes don’t move, but it does mean that the cat interrupts with a blur. 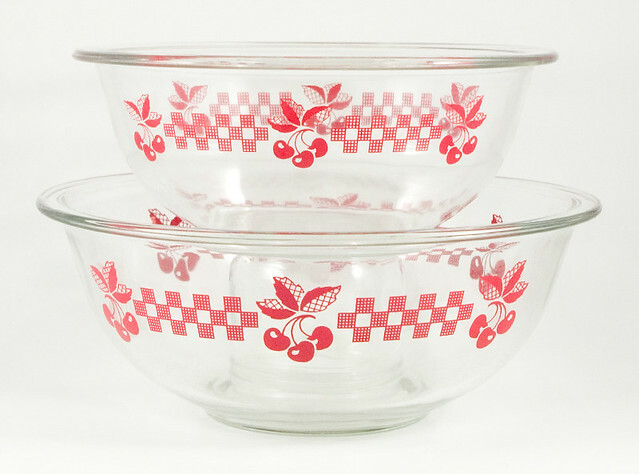 Last but not least, I have these lovely Checks & Cherries bowls, which are probably the most recent items in my collection. I love the vibrant colours! This pattern is also very rare, although more so in the US than in Canada. 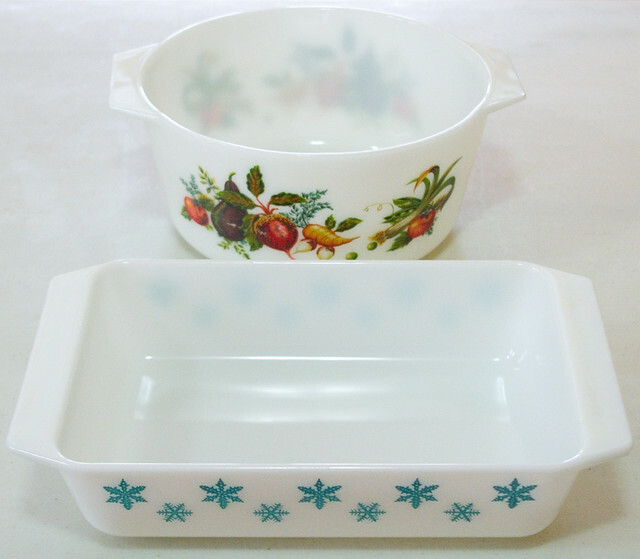 I’ve wrapped all of this Pyrex carefully and loaded it into boxes, ready to bring to the flea market on Saturday. I can’t wait! My favourite part of markets is when someone finds that one piece they’ve been looking for for what seems like forever. It’s so satisfying to see peoples’ faces light up with enthusiasm. It really makes my day! I’m really happy to say that I’ll be at the April 20th edition of 613flea at Lansdowne Park! It was kind of touch-and-go there for a while because I missed the vendor application date. I got really sick with yet another sinus cold that week, and it just plain old slipped my mind. That’s one of the downsides to working for yourself: if you get sick, there’s nobody to fill in for you. Luckily the organizers of the market were able to squeeze me in, so I’ll be there with bells on! The April market happens to fall on the Saturday of Easter weekend, which means everybody will be thinking spring, so I thought I should focus my attention on some of the more colourful items I could bring along. It turns out that I have a number of new-to-me green pieces! I’m particularly fond of the way that the green shades gradually from light to darker on this large 1971-1972 Cinderella bowl in the pattern “Green Dot-Squares”. The Spring Blossom pattern ran for quite a bit longer, from 1972-1979, and I think that’s why so many people of my generation have happy memories of it at their parents’ or grandparents’ house. 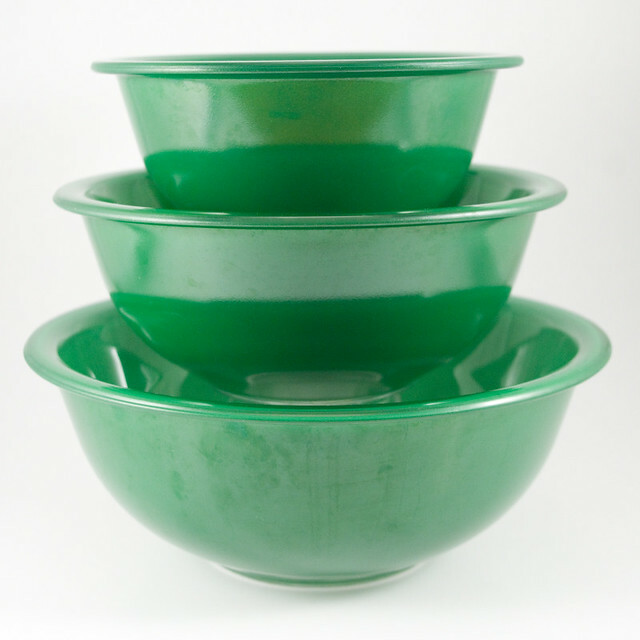 This nesting set of Cinderella mixing bowls in coordinating shades of green is also from the early 1970’s, although in my research I haven’t yet been able to narrow it down to a specific year. 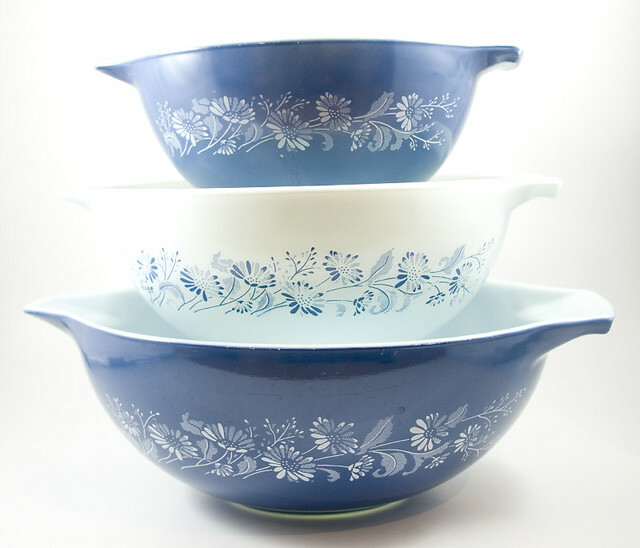 These coordinating casserole dishes look great together, but I know they’re not all from the same decade. 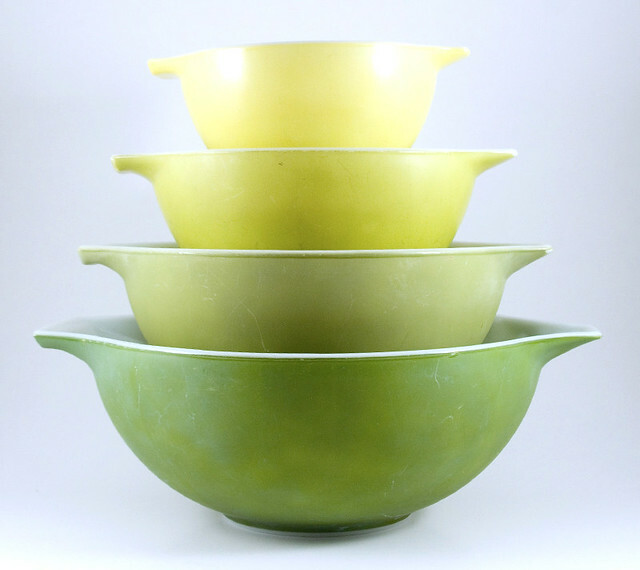 The top one, which is a vibrant lime green even though the photo doesn’t do it justice, began being manufactured in 1952 and continued into the 1960’s. The greenish-yellow and olive, though, were also made in the 1970’s to coordinate with the mixing bowls. I have to admit, I rather enjoy researching new patterns and styles, although sometimes I don’t get the most precise results. It’s finally that time again! This Saturday will be my first market of the season, and since I haven’t had a show in like three months I have so much new stuff to share. 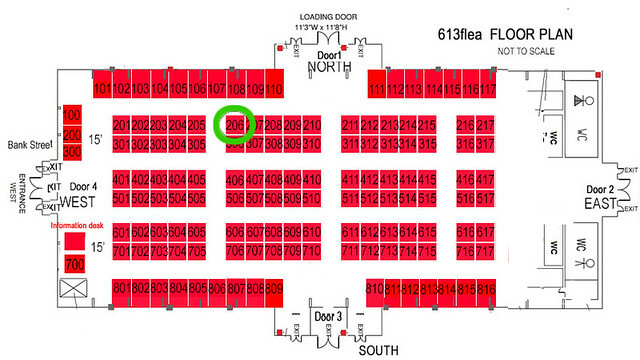 But first, the layout has changed a bit from last year, although I’m happy to say that I have a corner booth (perfect for my preferred layout) that is near where you could find me last year. I’m still on the northwest side of the building, just a little further from the centre doors. Since this is the March market and hence the one closest to Saint Patrick’s Day, I thought I’d showcase some of my green pieces. 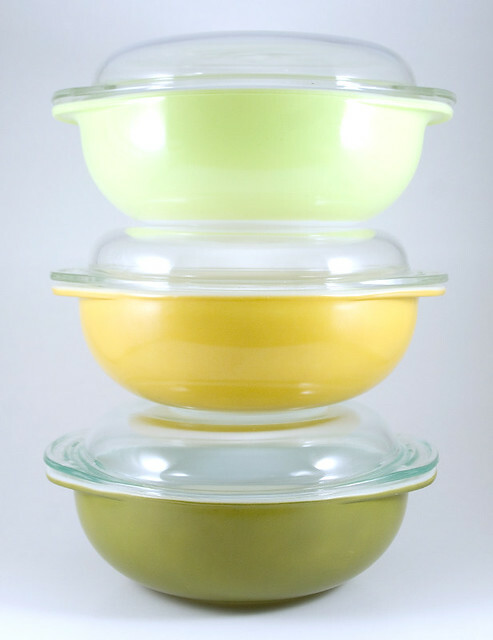 These stacking Pyrex mixing bowls are from the 1980’s; this style remains a pretty constant favourite. 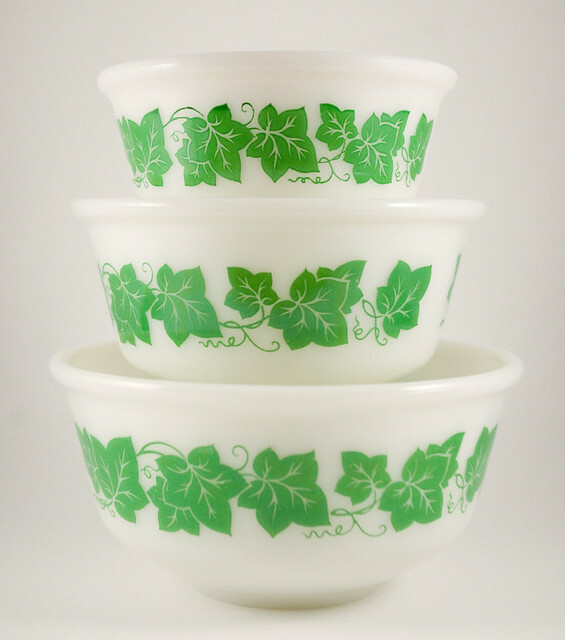 These Hazel-Atlas bowls have a lovely green ivy print. 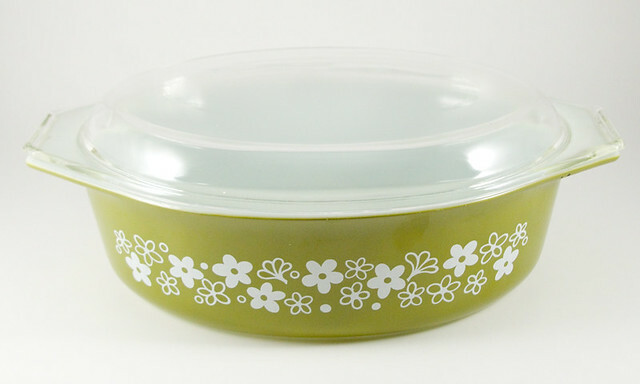 This rather large oval casserole dish is from the 1972-1978 Pyrex Spring Blossom Green collection. This is my most vibrantly green piece — although it’s only this bright under UV light. Granted, it’s still a lovely green otherwise. It’s Depression glass; this type is also known as uranium glass because a tiny bit of uranium in the mix is what gives it its colour. 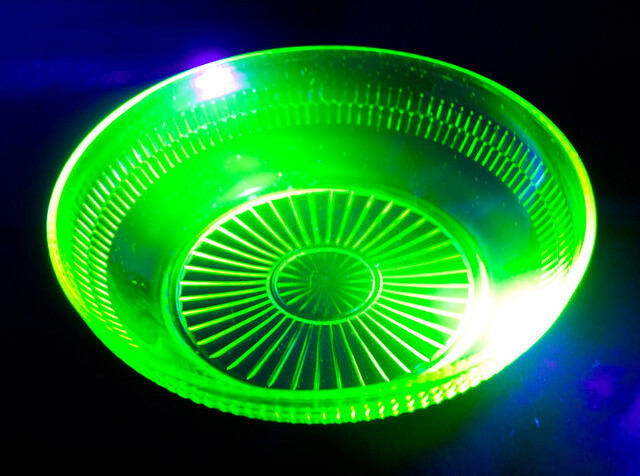 It’s also known as Vaseline glass in some places, but while all uranium glass may be called Vaseline glass due to its colour, all Vaseline glass may not be called uranium glass because it doesn’t all contain uranium. Don’t worry, there’s not enough uranium there for it to be dangerous; it’s no worse than eating a banana. Hope to see you at 613flea! 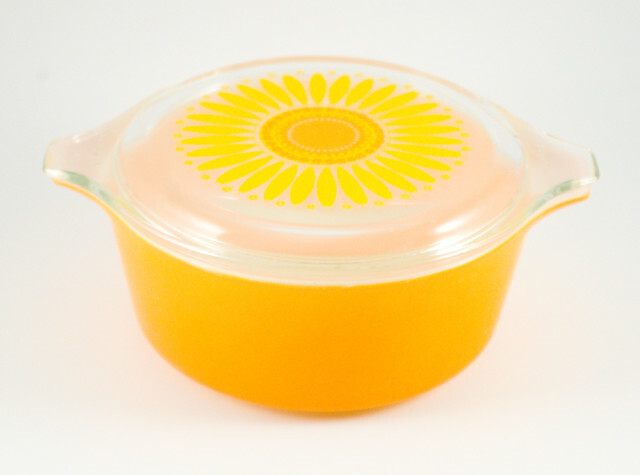 I’ve featured the Daisy pattern (1969-1970) on my blog before, but this is the first time I’ve had a casserole with the clear lid. It was also printed in the same pattern on a white lid during the same run. The Early American pattern (1962-1971) was also called Early Canadian; the pattern is the same, but it was named differently for the different markets. It came in multiple colourways, and all of featured designs printed in 22-karat gold. Since microwave ovens only started to become affordable for home use in the early 1970’s, and common beginning in the 1980’s, the company wasn’t able to foresee the issues surrounding metal decoration for dishes. 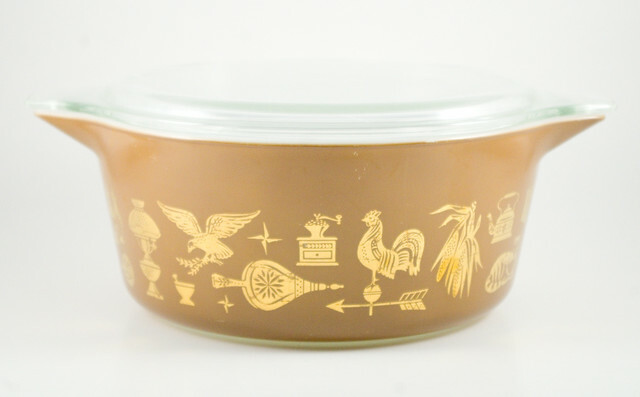 Therefore, as with all Pyrex dishes with gold designs, this one isn’t microwave safe — but it is still good for fridge, freezer, and oven. 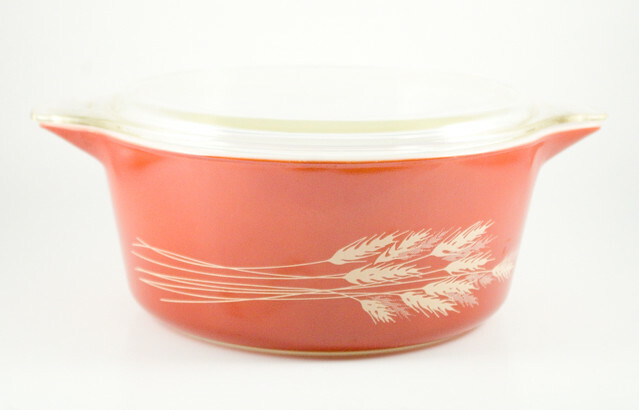 The Wheat pattern, from 1978, is a little more versatile than its fancier brethren, since the non-metallic screen-printed design is microwave-safe. Last but not least, I found two versions of the Market Garden print (1971-1982), which remains as colourful and detailed as the day they were printed. 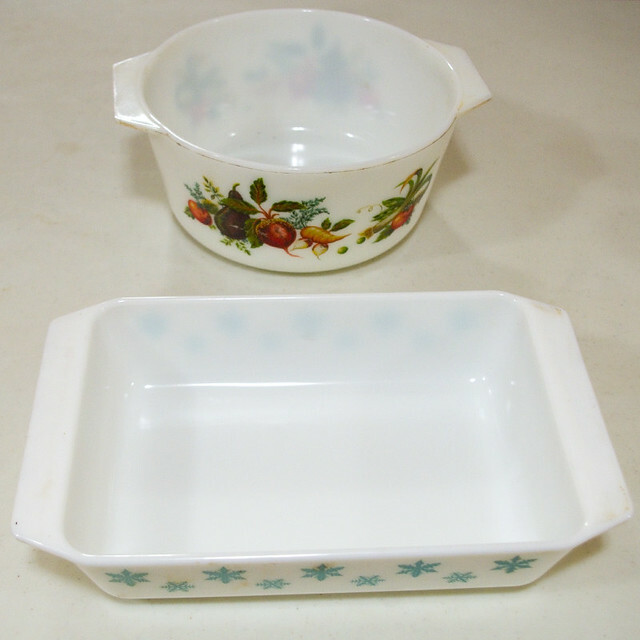 These dishes were labelled as JAJ pyrex, which means they were made before 1973, since Pyrex made in England was only labelled as such between 1921 and 1973; after that it would have been labelled Pyrex England, when the company changed hands. I do find that there is quite a stylistic difference between the dishes made by the American and English subsidiaries of the company. Overall, the ones with American or shared designs tend to be plainer and simpler. However, many of the ones released solely in England are much more complicated, often with multiple colours, finer lines, and designs that are closer to photos than line drawings. Which one is better is entirely a matter of personal preference, though; functionally, they all work just as well. I’m so looking forward to the 2019 market season! For me that won’t start until the March 9th edition of 613flea, which means that until then I’ll be working on leveling the collection I have to share. Even though I have to have patience until my next market, I have to admit, I’ve been taking a great deal of joy in some of the “new” (well, new to me) Pyrex items I’ve found. One of the things that has been holding me back when it comes to posting about my latest finds is that, frankly, I didn’t have enough room to photograph them decently. My workspace had become cluttered and messy, and my light box was just too small for the larger items. I have an absolutely lovely fold-up light tent that has worked for me for years (it’s so convenient!) and I’d eventually love one in the same style in a larger size, but right now I needed something quick and easy. So I got some large pieces of poster board and made something very akin to what you’d find in this tutorial. I think the results were pretty grand! 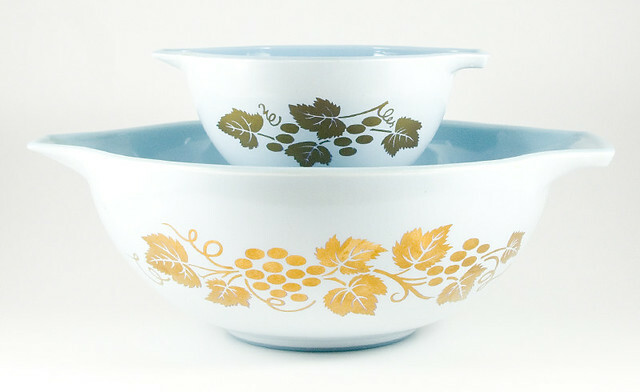 I absolutely love these Cinderella mixing bowls in the Colonial Mist pattern, which was originally sold from 1983 to 1986. 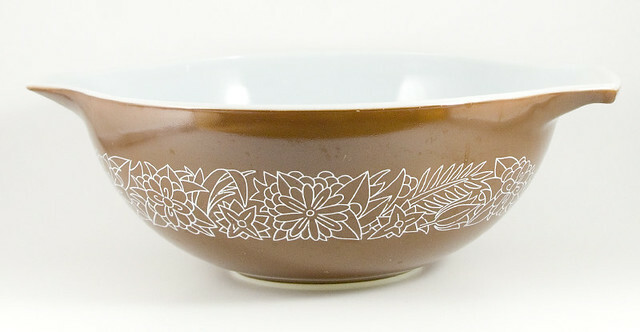 One great thing about this style of bowl is that they’re also ovenware, so they do double duty as casserole dishes. 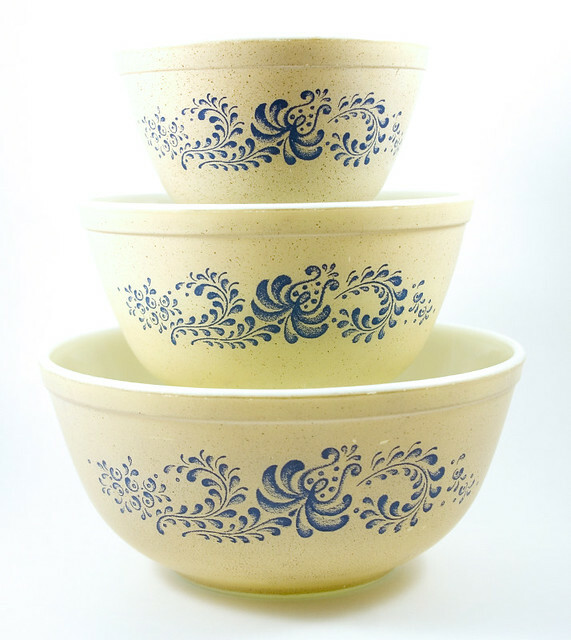 This set of three mixing bowls in the Homestead pattern (1976 to 1980) is a more standard shape, but also be used in the oven or microwave as well. I was especially happy to find this Pink Daisy casserole, even though it’s a bit worse for wear and without its lid, because pink is a highly sought after colour. 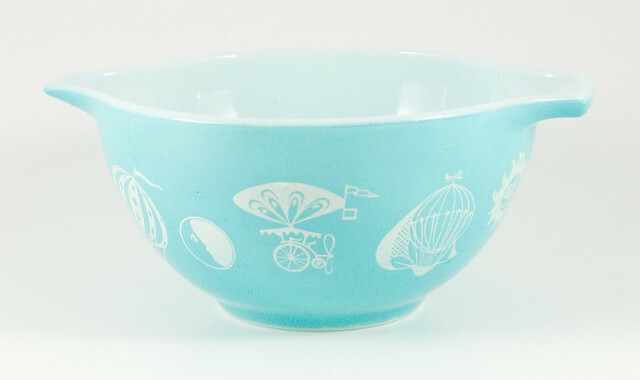 This particular pattern ran from 1956 to 1962, so this dish is between 57 and 63 years old, which adds to its rarity. 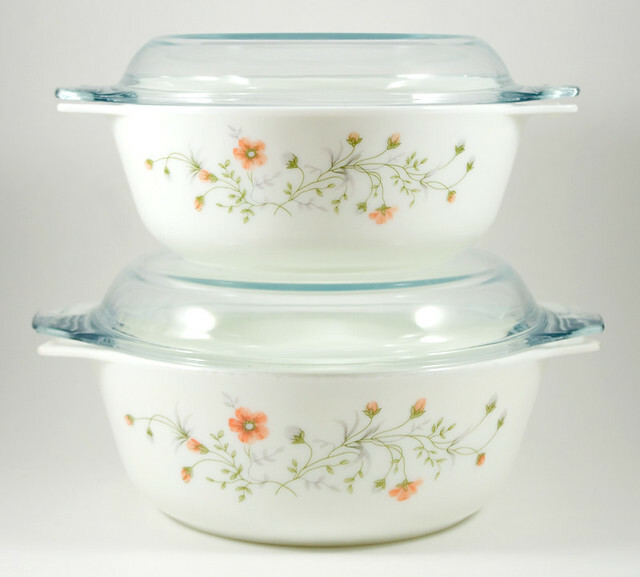 These Pyrex England stacking casseroles in the Emily or Spring Garden pattern aren’t quite as vintage, but since they’re from 1986 that means they’re still 33 years old — and they’re imported. 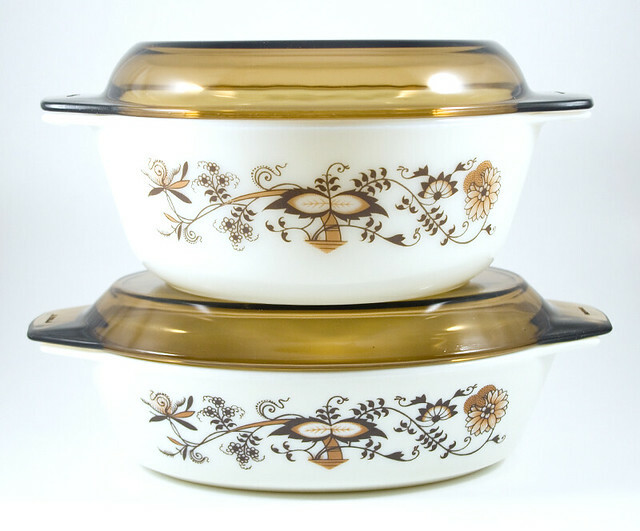 Given the colours of the pattern and the brown lids, I would have pegged them as being from the 70’s, but these Pyrex England casseroles in Brown Vine are from 1983 to 1985. 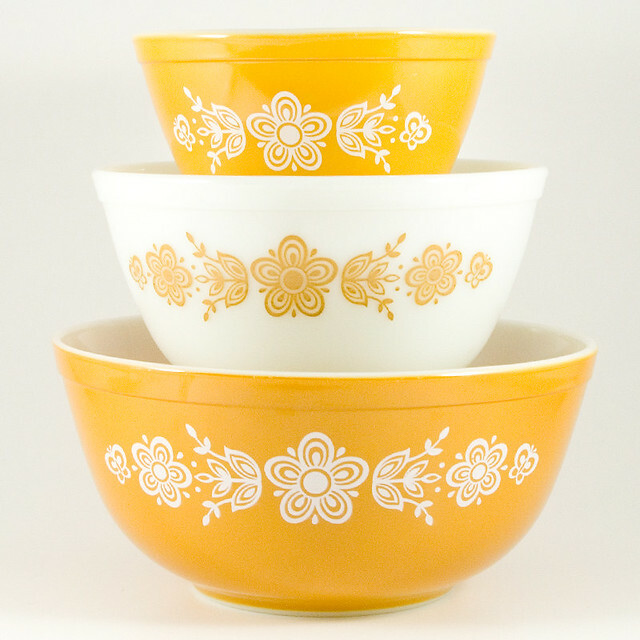 People have asked me why I like vintage Pyrex (and vintage kitchenware in general) so much. Although I really do love that I’m keeping perfectly serviceable items out of a landfill, I there’s more to it than that. I think it boils down to the fact that I like pretty, unusual things, and when I use such things I feel better about whatever I’m working on. Cooking is something that has to be done every single day, and it’s easy for it to become dreary and monotonous. I try to alleviate this by trying new dishes, new styles of cooking, and new techniques, but I think that it also helps to surround yourself with things that make you happy. To me, there is a thrill of the hunt for things that I consider both practical and beautiful, as well as a great deal of satisfaction in using these things once I have them. To paraphrase Marie Kondo, for me, these things spark joy. At my last flea market, one of the other vendors (a lovely lady selling the most fabulous knitwear) asked me how I get my Pyrex so clean and shiny. She’d had some issues keeping hers looking its best, and was wondering if I had any tips or tricks. I kind of brushed it off with an, “Oh, I just wash it!” But later I thought about it and realized that I really do have a process that I use. I thought I would share it here so that I can help other collectors. For the purpose of demonstration, I’ll use the two pieces that came into my possession recently. 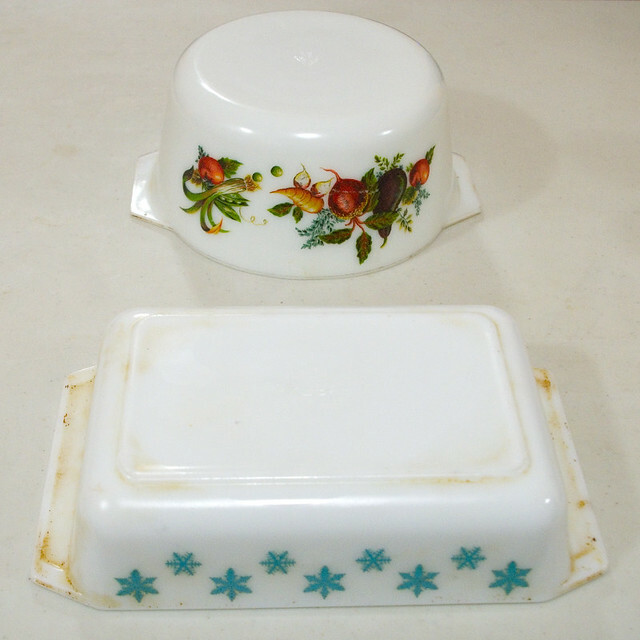 The top one is a JAJ Pyrex casserole in the Market Garden pattern from 1971. 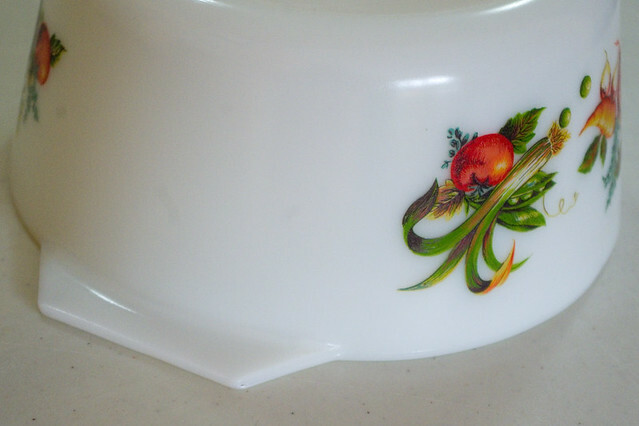 (James A. Jobling’s company produced Pyrex in England from 1921 through 1973, when the patent rights reverted to Corning; after this point, the “Pyrex England” backstamp was used.) 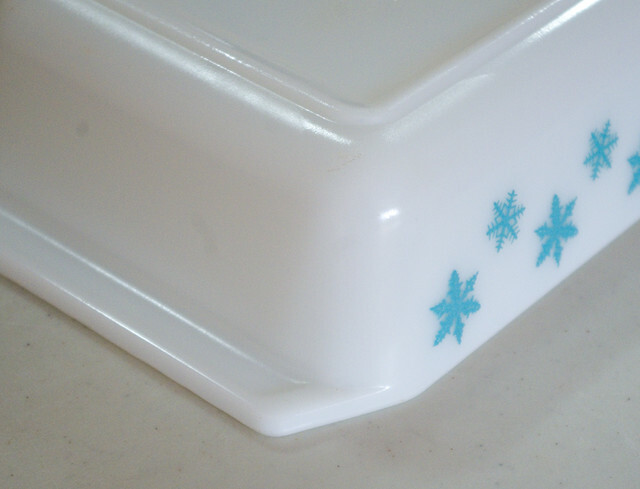 The bottom is a rectangular casserole from 1956 by the American Pyrex division in the Snowflake pattern, which is the very first pattern that was ever screen printed onto Pyrex. Given the age and condition of these pieces, I really want to keep the designs intact. Most importantly, when I got them there were no chips or nicks, which is something even the best cleaning can’t fix! To be honest, these dishes aren’t in the worst condition of the ones that have come into my collection; some good examples of how bad it can get are in my old Cleaning Glass post. As is quite common, the inside of the casseroles were in pretty good shape, since people are most picky about keeping the parts that touch their food in the best shape, but the bottoms were worse off. But do not despair if you see this brown residue on a dish that you want, since it will totally come off with a bit of work! One of the most important things I can say about cleaning old coloured Pyrex, whether it be solid-colour or screen-printed, is not to put it in the dishwasher. They won’t warp or chip in there — after all, they’re meant for the oven and even the oldest are safe for the microwave if there’s no metallic trim. However, the harsh chemicals and high heat of the dishwasher can fade or even completely erase the beautiful colours over time, so I really would recommend avoiding it! 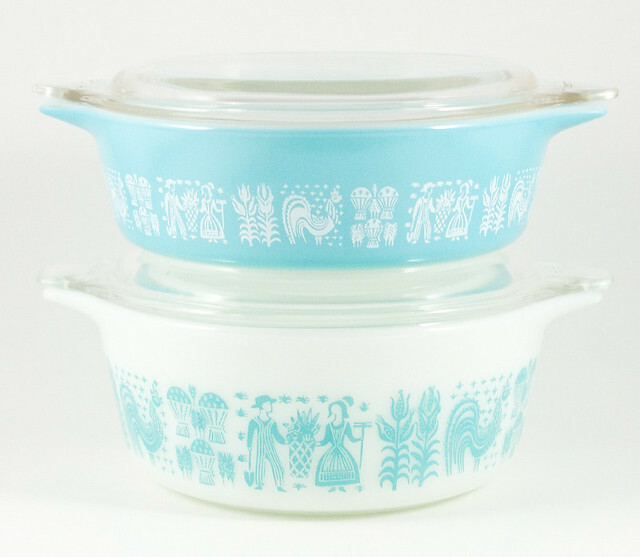 Of course, modern Pyrex and Corningware are dishwasher-safe, so if you’re not sure of the age of a piece, look for the stamp on the bottom that labels it as such. On the Market Garden piece, the worse part was where food debris had collected in the edge around the rim. This is usually really hard to get out, but I have a technique for that which works for most dishes. 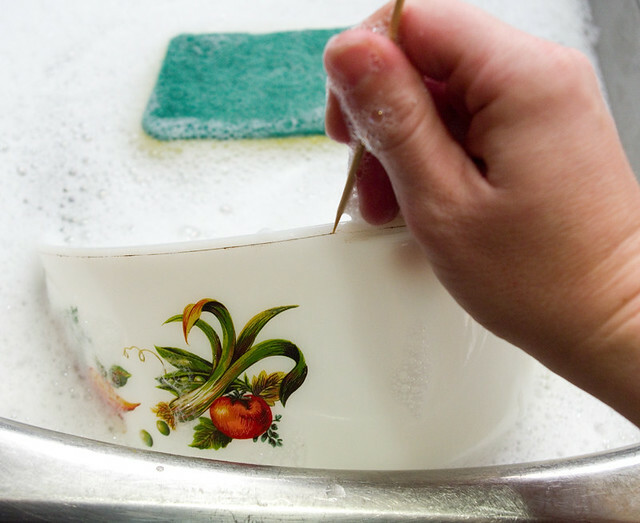 When cleaning coloured Pyrex, one of the things you want to avoid the most is heavy-duty scrubbing. So, no highly abrasive cleaning powders or scouring pads! (Although I’m quite enamoured of Lee Valley’s stainless-steel chain mail scrubber, which is great for cast iron, it would utterly ruin a Pyrex dish.) 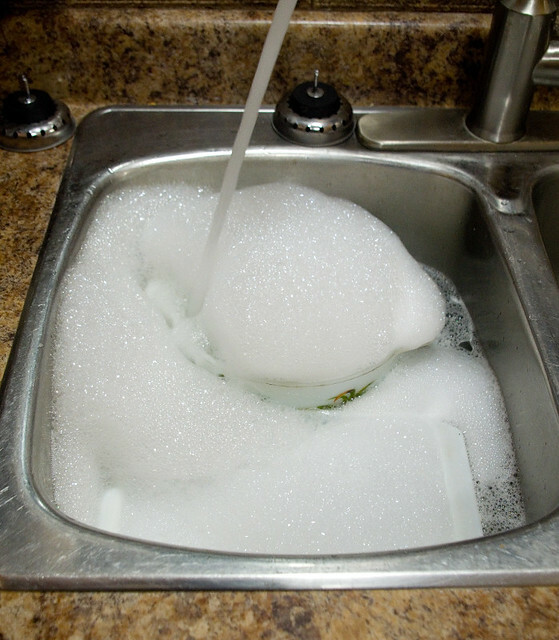 So your best bet is to fill up a sink with hot water and a generous helping of dish soap, and then let that sit overnight. Yes, the same technique for tackling the roasting pan from the Christmas turkey works with Pyrex, but why wouldn’t it? When it comes time to scrub the dishes in the soapy water, I like to use the double-sided cleaning sponges with the green scrubber. I find that they’re generally abrasive enough to get rid of stains, yet not abrasive enough to remove designs (unless you scrub for a really long time — always be careful!). And here you can see my secret weapon: bamboo skewers. They’re perfect for getting into tiny little areas that accumulate grime, but because they’re so breakable it’s really difficult to scratch the finish with them. The wide end of the skewer can even be used to concentrate your effort on areas with a thick layer of baked-on grease; I used them to great effect on my enameled cast-iron pan. As a bonus, they’re not strong enough to go through the enamel on cast-iron either (on which you also don’t want to use anything too abrasive lest you damage the finish). 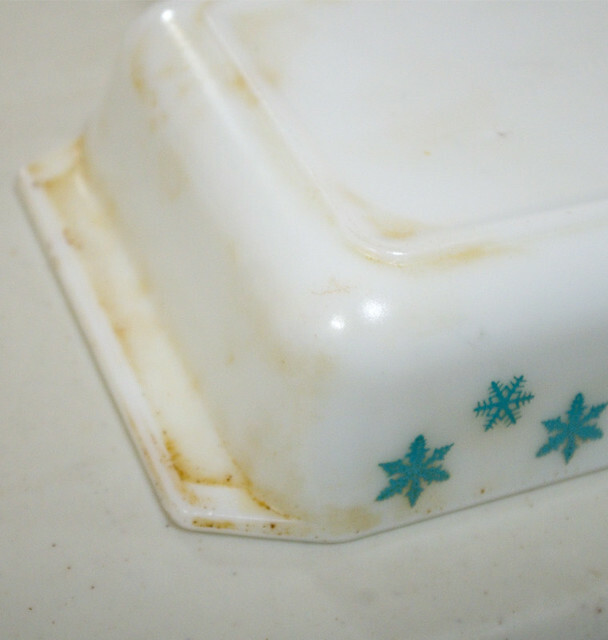 I was lucky this time in that the Snowflake dish came completely clean with this treatment, even though it looked like it was in the worst shape. So I only had to do the next step on the Market Garden piece: a paste of baking soda and lemon or lime juice. The juice is acidic and the baking soda is slightly abrasive, which makes for a perfect cleaning combination. I left the past on overnight to dry, then added more lemon juice to scrub off the stains the next morning. Then, for a super-shiny finish, I gave it one more good wash in dish soap and water. Sometimes, with dishes in really rough shape, you have to repeat these steps a few times. 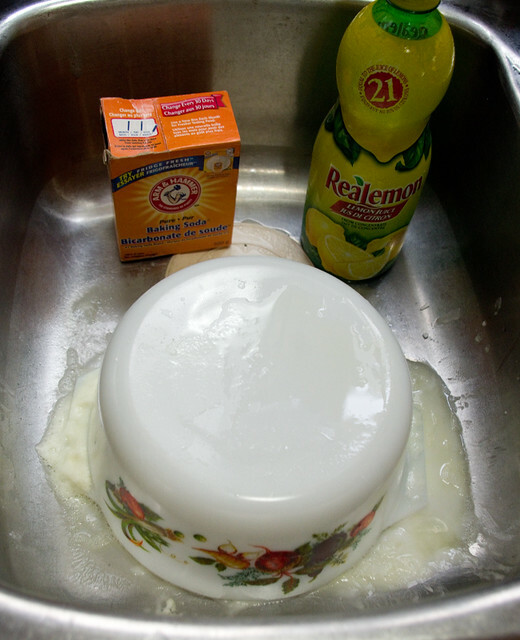 One other thing you can try, although only as a last resort, is a sink full of hot water and a single dishwasher detergent packet, left to sit overnight. I only do this when the dishes have resisted every other cleaning method, because the detergent is really harsh and concentrated. But I much prefer using one of the packets instead of giving up altogether! However, this time I didn’t have to resort to such drastic measures. And interiors from which you’d be happy to serve any guest. 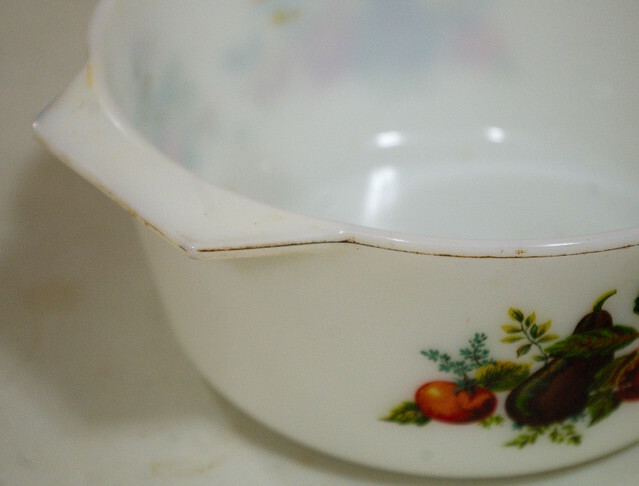 So next time you see an old Pyrex piece that’s a bit worse for wear, don’t automatically discard it because of the amount of work that’d be involved bringing it up to snuff. It may take a couple of rounds of soaking, but it can look like new again without all that much elbow grease! 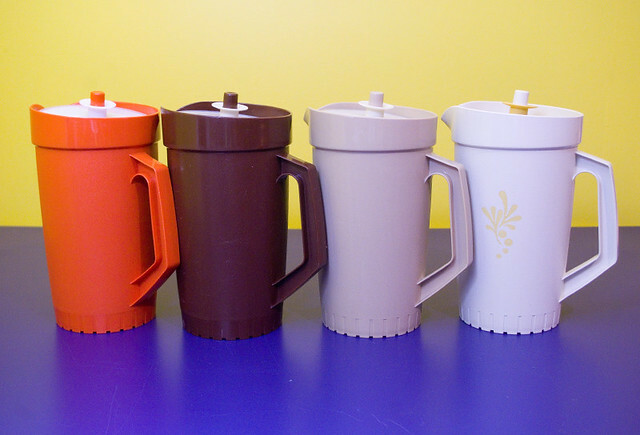 When I’m at the flea market, one of my most consistent sellers is vintage Tupperware pitchers. I hear so may people exclaim that they remember them fondly from their childhoods, generally filled with Kool-Aid and paired with bell tumblers. I have to admit that they were a consistent part of my childhood as well, even though at our house they were filled instead with juice that came out of a can in the freezer. However, this past weekend I learned that these days they have an alternate use. One lady came to my booth and was absolutely thrilled to learn that I had one vintage pitcher left because she uses the lid for wet felting. 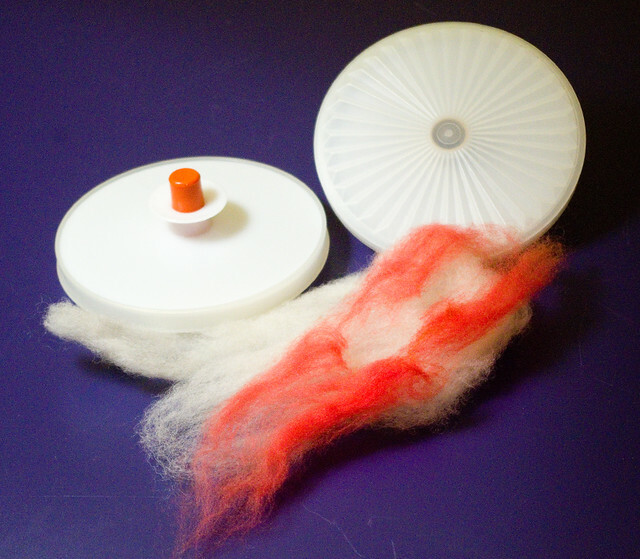 For those not into such things, wet felting is a craft that uses layers of wool roving or yarn, agitated together with hot soapy water until it all sticks together as a single piece of fabric. If you’ve ever accidentally thrown a piece of woolen clothing in the washing machine and had it come out shrunken, stuck together, and unwearable, you’re familiar with the process. However, wet-felting is when it’s done on purpose to create pieces of art. The end results can range from absolutely gorgeous to terribly cute. What makes these pitchers such great finds for wet felters is the ridged undersides of the vintage lids. (The lady I spoke with told me that the lids of new Tupperware pitchers have been redesigned so that they’re smooth on the bottom.) The ridges are perfect for gently agitating the layers of wool so that they stick together. And the handle makes for an easy grip. Apparently the pitchers are considered to be great finds by this crafting community, not only because they don’t make them that way any more, but also because they’re generally snapped up so fast.